Who knew a tiny island off the coast of Venezuela could become the vacation mecca of thousands from both hemispheres? Aruba is that island and if you haven’t been there, it’s worth a visit. Aruba has some of the most beautiful beaches on the planet, and the most diverse terrain. The New Rich make Aruba one of their weekend destinations. Come here to tan during the day, play at night – more casinos that you can shake a stick at and fun and games down near the pool each night. Ready to play? One of the nicest beaches in Aruba is Eagle. We’re not sure how it got that name, but it is the place when locals want to have a party. You’ll find it exciting too, with wide sand – so pure you’ll swear it’s sugar, and water so calm, you’ll think you’re in a pool. There’s really nothing like Eagle Beach Aruba. But things do change and recently there have been some challenges to this best beach. Now, all of Aruba’s wonderful beaches are public – just the chairs and shade huts belong to the hotels for their guests. So if you plan an Aruba vacation and don’t leave the beach near your hotel, you are missing out on some of the most spectacular views the island paradise has to offer. Eagle Beach is just south of Palm Beach. A rocky outcrop separates the two, but it’s difficult walking between the two. And when you do get to the rocky limestone outcrop, stand for a bit and wait for the local flock of brilliant green parakeets who make their home there. Some will even come close by and grace the trees around you. These are local to the islands and protected. 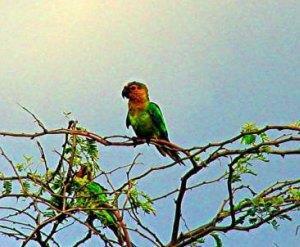 Chance to see them, early morning, mid afternoon. You can’t miss their screech! They call to one another as they fly through the Arubian air. Eagle Beach Aruba is across the road from the La Cabana Resort and some timeshares. This beach simply takes off. The more shallow water right off the beach gives a whole different perspective to Caribbean beauty. Relax under a palm tree. Snorkel out and see colorful fish. Take a cruise on one of the local catamarans. Eagle Beach Aruba is home to all this plus spectacular time shares, hotels and resorts. If you’d like, Aruba provides for local shaded picnic areas. You’ll love this, especially if you’re a family – the beach slopes slowly and the water is shallow and warm. But remember, the locals love this beach as well – weekends get crowded. And who said you couldn’t have it all? Hotels and resorts along the beach offer scuba diving, snorkeling gear, windsurfing and more. Arrive early and enjoy fun before the sun heats up the day. 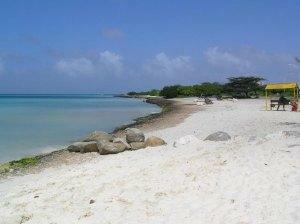 Rated the second best beach on Aruba, Eagle Beach is clean and wide, and one of the longest beaches on the island. You can hike the whole length get a tan and exercise at the same time. The very best sand is directly in front of La Cabana and the Amsterdam Manor. When you plan your Aruba vacation, include a trip to Eagle Beach. Phoenix Beach is close to Eagle Beach. Check it out. In addition, the Playa Linda Resort in Aruba is in this area. More pictures and information await. 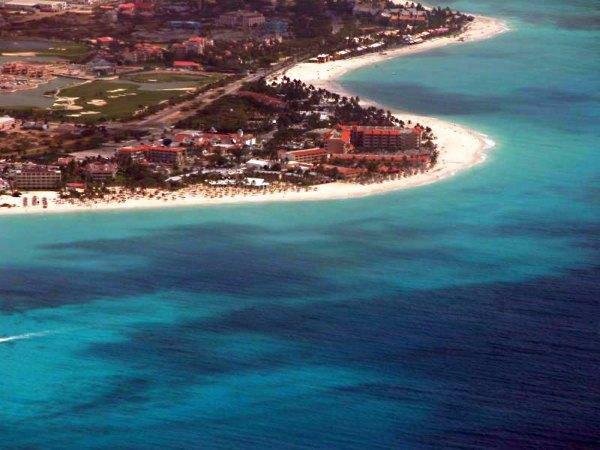 Eagle Beach can thank the name to the Arend Petroleum Maatschappij which was a refinary in Aruba in the 1920s. Arend means Eagle in Dutch.